Porto Rotondo and from its famous restaurants, bars and clubs. 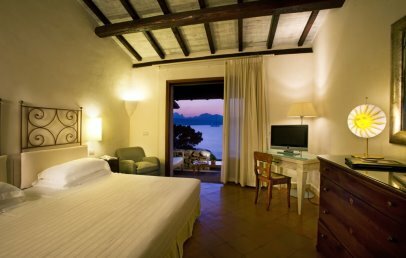 Ideal for couples of all ages, the hotel Sporting is also appreciated by sea lovers thanks to its private coves, just a few minutes from the sea view rooms. 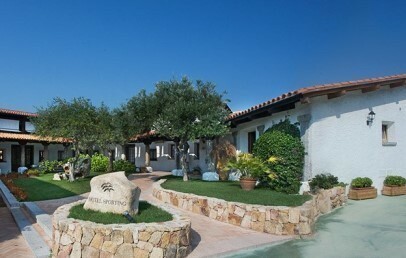 The Hotel Sporting is located on the last edge of landscape of Porto Rotondo. On one side there is the luxury Yacht port and on the other side the open clear blue sea. Only a short walk distance to the very centre of Porto Rotondo with several restaurants, bars, clubs and shops and where you can enjoy the architecture particularity of Porto Rotondo. The airport Olbia-Costa Smeralda is around 30 minutes drive. 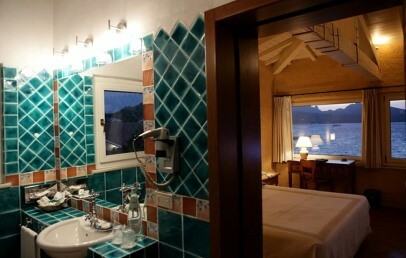 One of the first 5* hotels built in the Costa Smeralda in the 60ies and still today it is a beauty. It is an elegant Villa, embedded in nature directly by the sea with a private beach. The Hotel Sporting in Porto Rotondo offers a piano bar with live music ideal to enjoy aperitif or cocktails after dinner as well as a good à la carte restaurant with large covered terrace facing the pretty garden with pool and the Yacht club of Porto Rotondo. For relaxing hours or sun bathing moments the nice garden with seawater pool or the private beach area of the Hotel are at guests full disposal. The privat beach is furnished with sun umbrellas as well as sun beds. 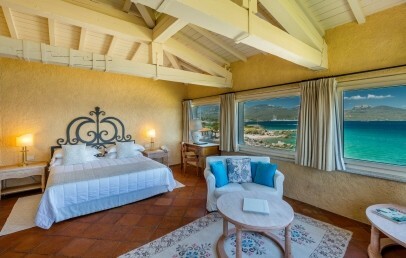 The Hotel Sporting in Porto Rotondo has 41 double rooms, 5 Junior Suites and 1 Suite. 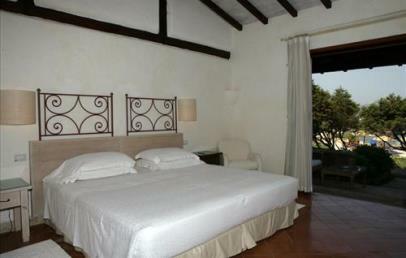 All rooms are renovated and has been furnished comfortable and with style. They have all air condition, satellite TV, minibar, safety-box, bathroom and hairdryer. 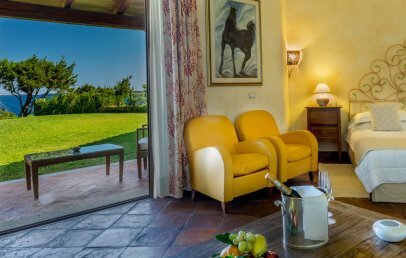 Each room has a terrace either with view on the garden or at the sea, some fes rooms with sea view have a direct access to the private beach. 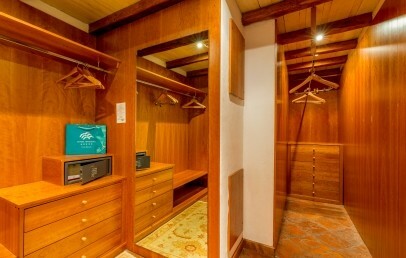 Junior Suites are about 28 sq.m. and have a living room corner with sofa bed and a bigger bathroom. Some of the Junior Suites are located on the ground floor and some on the 1st floor. The Suite is about 150 sq.m. in size including a panoramic terrace with outdoor jacuzzi. The Suite has a bedroom and a separated living room. Best for guests who likes more comfort. A tennis club is located 300 m away and the known Pevero Golf Club 18-holes is 20 min. drive away as well the Jet-Set place Porto Cervo and Costa Smeralda are close to reach and in high summer months amusement and animated live is guaranteed. Further nice boat trips along the Costa Smeralda, to the Archipelago „La Maddalena“ and cruise till Corsica can be organised and are certainly a high light for whom likes the sea. For guests who prefer visiting the land part of the Gallura, Porto Rotondo is also a good strategical point for unforgettable excursions. Elegant double room with an additional 3rd bed on request. 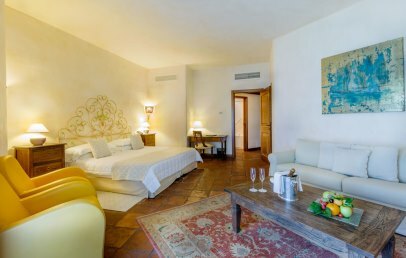 The style of the rooms is typical of Sardinia characterized by wooden beams and soft coloured furnishing. The bathroom has a shower or bathtub and hairdryer. Each Superior room has a terrace with garden view. Elegant double room with an additional 3rd bed on request. 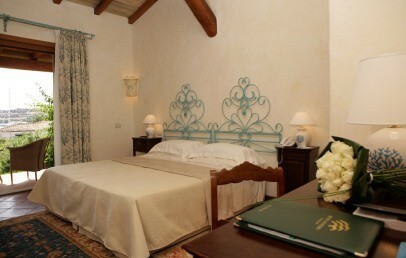 The style of the rooms is typical of Sardinia characterized by wooden beams and soft coloured furnishing. The bathroom has a shower or bathtub and hairdryer. 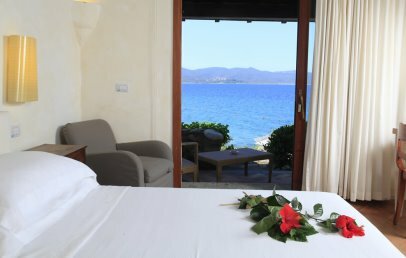 Each Superior room has a terrace with with sea view and direct access to the beach. The Junior Suite are located on the first floor of the Hotel. 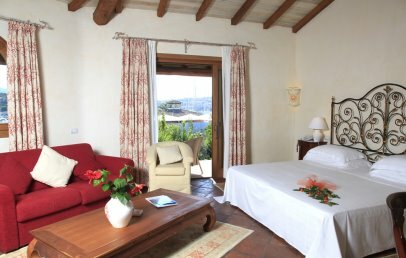 The style of the rooms is typical of Sardinia characterized by wooden beams and soft coloured furnishing. They consist of a lounge area equipped with wicker chairs. 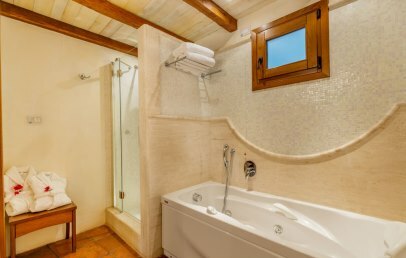 The large bathroom has a shower or bathtub, double sink and hairdryer. Each Junior Suite has a terrace with garden view. 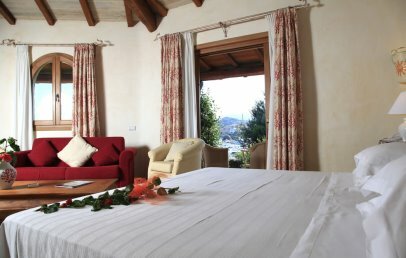 Large and elegant Suite composed of a double room and a spacious living room. 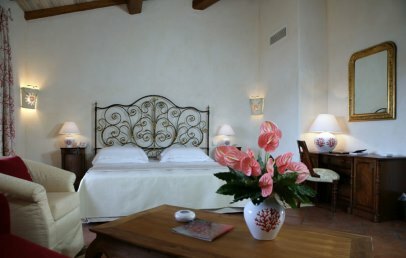 The style of the rooms is typical of Sardinia characterized by wooden beams and soft coloured furnishing. The bathroom has a shower, a bathtub and hairdryer. 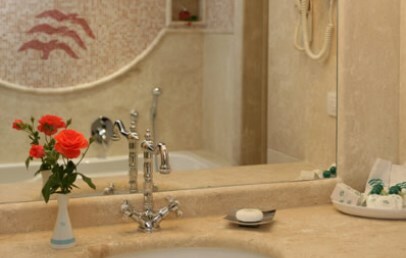 The panoramic terrace is equipped with a Jacuzzi bathtub and offer a striking sea view. The Junior Suite are located on the ground floor with an additional 3rd bed on request. 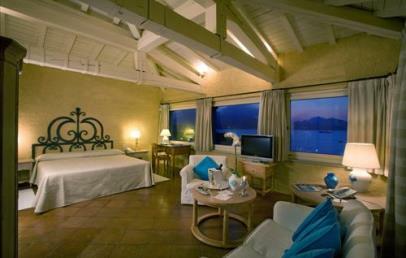 The style of the rooms is typical of Sardinia characterized by wooden beams and soft coloured furnishing. They consist of a lounge area equipped with wicker chairs. 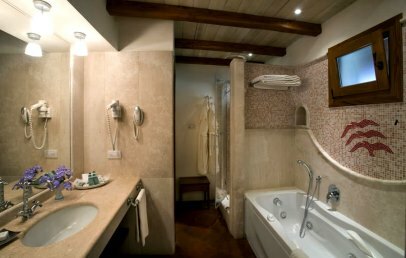 The large bathroom has a shower or bathtub, double sink and hairdryer. Each Junior Suite has a terrace with sea view and direct access to the beach. This Junior Suite is located on the upper floor. 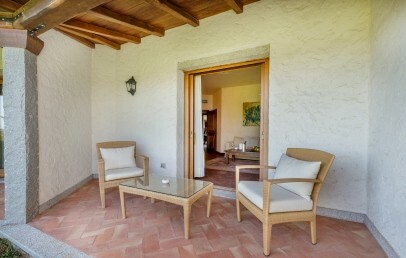 The furnishing is a mix of typical Sardinia characterized by wooden beams and modern amenities. They consist of a lounge area equipped with sofa and easy chairs. 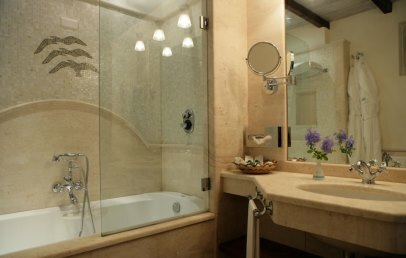 The bathroom has a shower or bathtub with hydromassage, hairdryer. The Panoramic Junior Suite has big windows overlooking a breathtaking sea view. 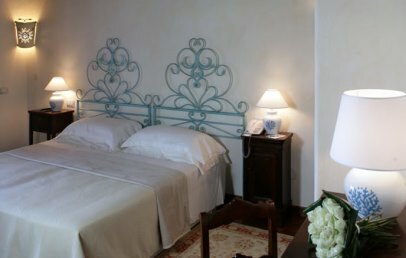 You can book your “Secret Room” with a special and very convenient rate: the reservation of the Secret Room includes a special discount, but does not allow you to select the room typology.